Files are stored on local hard drives or network servers, and maybe easily accessible to unauthorized individuals. Files may be modified, copied or deleted by unauthorized personnel with no record of these events. There is no audit trail of changes made to the file, even when made by authorized personnel. There is no version control of such files. Any changes made to the file obscures the previous version of the file. There is no provision for electronic signatures. Data is stored in a single flat file which can be subject to accidental erasure or corruption. Store your files in a SQL or Oracle database vault. Files must be checked out in order to make changes to the file, and then checked-back in after changes are complete. 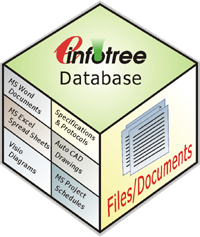 Full version control is provided, with all versions of a file stored in the eInfotree File Vault. All events are logged to the audit trail database. File events can be configured to require an electronic signature. Access to files can be restricted to authorized personnel. Unlimited number of security levels can be established and applied. Files can be accessed globally using a web-based browser interface.